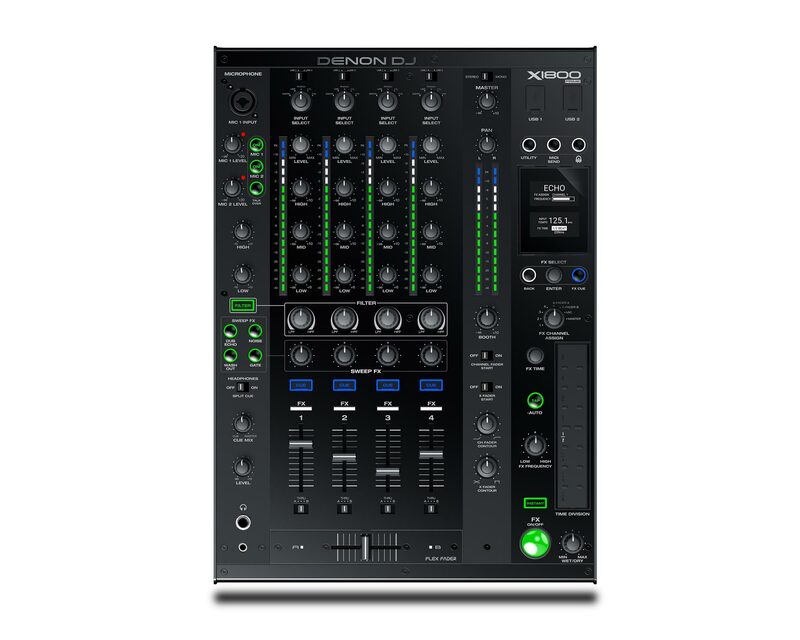 The DENON DJ X1800 PRIME is a 4-channel DJ club mixer with creative and powerful Sweep and BPM based FX controls. True to the Denon DJ engineering heritage, the X1800 features extremely high-quality, 24bit, 96kHz audio output, ensuring superb sound characteristics. The X1800 is perfectly suited to integrate with Denon DJ’s new SC5000 Prime media via the EngineTM Connect protocol. This shares the beatgrid and time information with the mixer, from the player, to align the FX LFOs. Denon DJ’s expressive ‘Flex-Fader’, Crossfader adds diverse physical performance flexibility, whilst the all-new frequency controlled ‘Band-Isolation’ brings even more sonic manipulation possibilities to creative DJs. The X1800 incorporates a comprehensive array of performance and convenience features that set it well apart from ordinary mixers. Its dedicated Sweep and BPM FX controls, deliver dub, echo, noise builds and reverb effects for each channel, giving DJs even more performance options to craft a unique sound. There is also Send and Receive FX routing. Add to this, the ability for DJs to express themselves using more powerful, menu based EQ tools, with switchable ‘Classic’ or ‘Isolation’ modes available plus a powerful Lo/Hi Pass Global Resonance control. 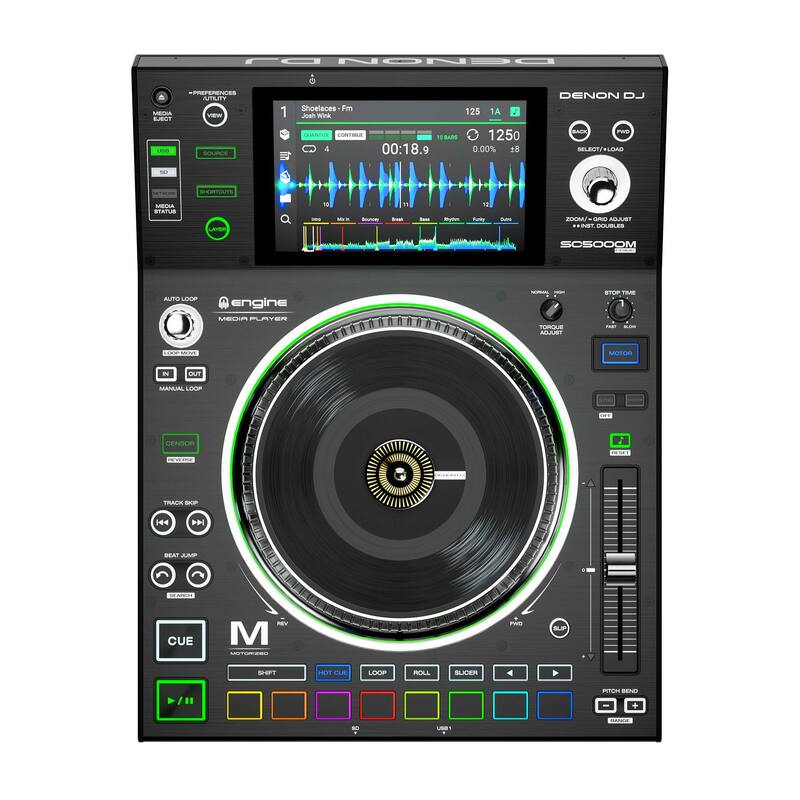 Viewed via the crisp, OLED screen, the main BPM FX unit has 12 high-quality effects and also includes a quick-to-set Effects Quantization Touch Strip, empowering DJ’s to apply elegant rhythm-based adjustments to shape their sound to its maximum potential. In addition, the X1800 has dual USB audio connections to facilitate 3rd Party DJ software and perfect DJ changeovers in the booth. MIDI-based effects and instruments can also be connected to the X1800, locking in tempo-based FX plus other rhythm or synth based instrumentation. For unsurpassed system expansion potential, there’s a 4-port LAN hub to connect up to four SC5000 players. Its dedicated digital inputs and output (for mixing in pure 24-bit/96kHz when connected to the SC5000) ensure the very highest audio quality—a must for demanding professionals. The SC5000M performance technology brings the power of two separate DJ media players, into one single unit. Mix and match between independently outputted tracks/layers and throw ‘instant-doubles’ across layers, or to another player – flexibility and creative DJ expression is now literally limitless. Dual layer. Two players in one. The SC5000M has a DAW quality, on-board time stretching algorithm that changes forever the quality expectations of DJs when performing with different genres, tempo’s and styles of open-format music. Musical key can be locked, super-extreme tempo changes can be effected and the result is sonic integrity across all audio frequencies. Bring a 95 bpm Hip-Hop track up in speed to mix into a 125 bpm House track, blend in a Trance track at 138, raise the tempo up to a Drum ‘n Bass track at 170, then fire in a Grime track back at 140 bpm – mixing creativity and sonic perfection on the SC5000M. The SC5000M – by Kenny ‘Dope’ Gonzalez. Masters at Work and House music DJ legend Kenny ‘Dope’ Gonzalez took the SC5000M Prime set-up to his livestream, studio and gig sessions recently in Ibiza – we caught up with this iconic Artist on get his first reactions to the real vinyl, motorized platter experience he felt on the ‘White-Isle’. "Wow! Denon has definitely brought the vinyl feeling back. This feels exactly like a turntable and it’s a 7” platter too which brings me back to playing 45’s as well. The players are great, lots of options like the dual-layer which is amazing because you only need two players to actually play four different records at any given time”. Kenny added, “I’ve been waiting for the ‘trigger’ feature too, so I can create new rhythms on the spot and experiment with it in the club. The looping feature too is great - it’s definitely moving in a fun direction for me, so I can’t wait to get with it!"